What’s the Fuss About the 5-Paragraph Essay? “”Our teachers are so happy with everything so far. They are seeing growth they cannot believe. A recent blog bashing the five-paragraph essay has gotten too much attention and too little scrutiny. A couple of weeks ago, an Ed Week article summarized high school teacher Ray Salazar’s post, and his claims of the five-paragraph essay being “rudimentary, unengaging, and useless,” were spread to a huge audience of educators. But this kind of black-and-white dismissal of any learning strategy isn’t constructive. There are good reasons why the five-paragraph essay endures. For our youngest students, for those who struggle academically, and for anyone who needs a jumping off platform to organize their ideas, the five-paragraph essay remains a powerful form with an important place in our teaching repertoire. To read Salazar, you’d think the five-paragraph essay is responsible for the death of all creativity and critical thinking in today’s schools. He argues that it is limiting and fails to prepare students for real-world writing. But what formats does he suggest in its place? The one developed by Aristotle for formal argumentation and the one recommended by the College Board for AP high school courses (known as “SOAPST,” in which students analyze a piece of writing according to its Speaker, Occasion, Audience, Purpose, Subject, and Tone). Criticisms of the five-paragraph essay offer alternatives that are entirely unfit for elementary students. Okay. These are worthy options for the College Board’s intended audience of AP high school students, and for students at the “selective enrollment” high school where Salazar incubated his ideas. But they aren’t much use in elementary schools. In K-5 classrooms, five to ten year-olds are learning to associate sounds with letters, connect those letters into words and sentences, and grasp the rules of English grammar. 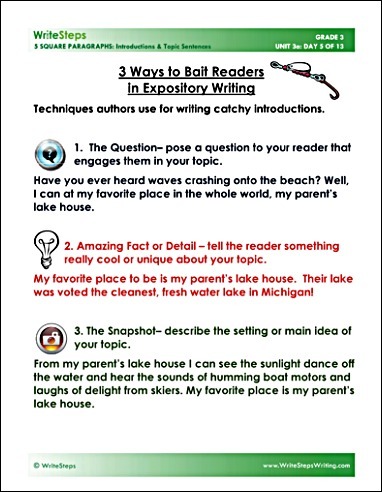 With the Common Core, they’ll also master writing certain text types: narrative, opinion, and informational pieces. The five-paragraph essay’s parallel structure is appropriate for students who are just developing their powers of logical reasoning and need help focusing their thoughts. Sorry, folks. Aristotle and AP essays aren’t going to work for eight year-olds. There’s another problem with Salazar’s criticisms. They all hinge on examples about high-performing students. But what about children who struggle in school? Students with ADD or learning disabilities, not to mention English language learners, need an accessible structure for information and opinion writing even more than their high-achieving peers. Anyone who has taught elementary school knows this. When students plan with our five-square graphic organizer, even those who struggle academically can craft written work that is clear and enjoyable to read. Salazar argues the five-paragraph format “promotes low-level summary that nobody really cares about.” This is true only if the teacher is falling down on the job. Any format can squash creative thinking (not to mention motivation) if teachers fail to celebrate their students’ ideas and writing voices. But no educator should teach structure alone. That’s like cooking a stew full of meat and vegetables but forgetting to add the spices. Our students learn essay structure while also studying the 6-Traits rubrics, which place equal emphasis on strong Word Choice, Sentence Fluency, Ideas, Grammar, Voice, and yes, Organization. They’re writing five-paragraph pieces but also analyzing strong vs. weak verbs and catchy leads, and celebrating anonymous student writing samples that express personality and emotion (Voice). 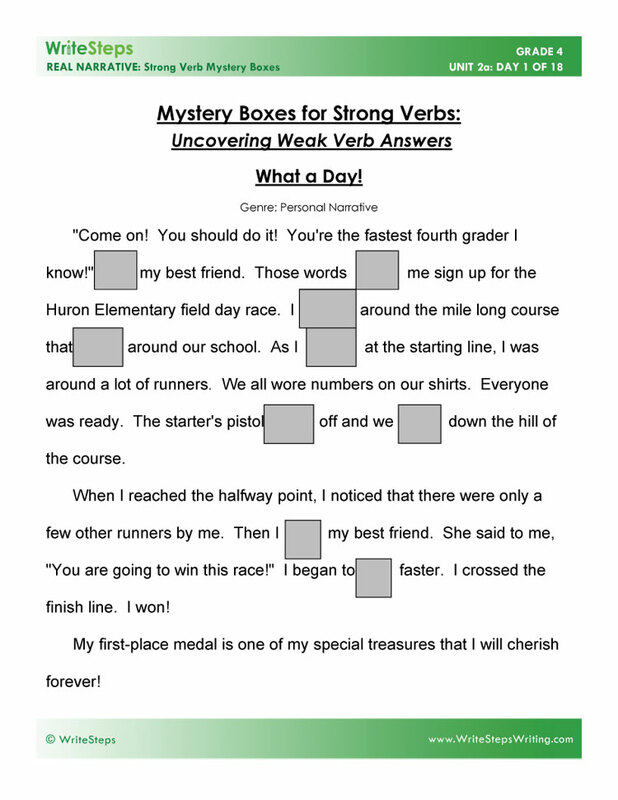 WriteSteps lessons are filled with activities that challenge students to think carefully about ideas while also creating a coherent structure. 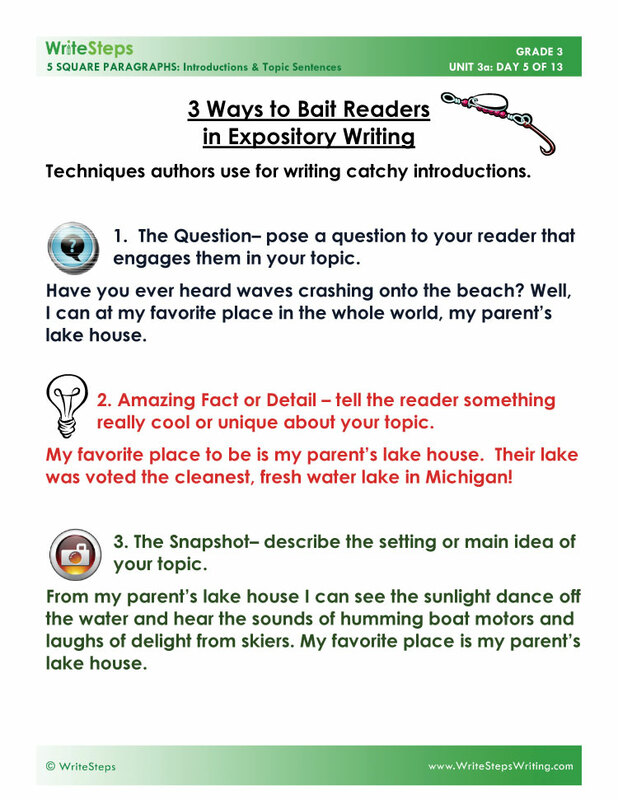 Here is a third-grade visual aid from a lesson on writing introductions. These are just a few examples of how good teachers show students the value of bringing out the flavor in their writing “soup.” Compare them to what’s often recommended in top-tier universities such as Georgetown. They’re strikingly similar. 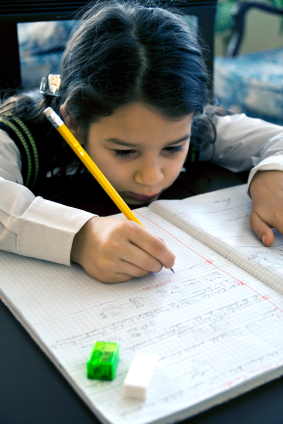 There are a lot of ways to help kids learn to write, and the five-paragraph essay isn’t the only one. But the criticisms we’ve seen in the last month overlook the needs of elementary students, children with ADD or learning disabilities, and English language learners. They also ignore the fact that good teachers use lots of strategies to help students cook up spicy writing that engages and persuades. Teachers, don’t be misled. Most children learn to walk before they learn to run. The five-paragraph essay remains a true and trustworthy stepping stone. Further Reading: The SOAPSTone method teaches AP high school students to write about the Speaker, Occasion, Audience, Purpose, Subject, and Tone of a piece. If You Teach or Write Five-Paragraph Essays – Stop It! includes a description of Aristotle’s recommended structure for writing arguments. This month we’re celebrating the addition of Terry Gates to the WriteSteps team. Like a modern day Johnny Appleseed, Terry tirelessly sews seeds to nourish the hearts and minds of children at risk. He has cultivated this passion by serving as an AmeriCorps*VISTA literacy volunteer, helping to eradicate child hunger and violence, and starting a non-profit to impact youth that includes connecting children to adult mentors. Terry says one of his greatest achievements has been to personally mentor five boys over the last 13 years. Youth mentor and WriteSteps Awareness Ambassador Terry Gates with his wife, Kim, who recently retired from a long career teaching language arts and special education. Kim is a WriteSteps enthusiast who’s supporting Terry in every way she can — even participating in presentations! 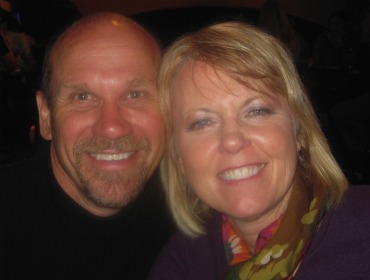 Terry and Suzanne met at a Title I conference where he was promoting parent involvement in schools. With his literacy background, Terry was immediately excited when he saw the WriteSteps lessons. He showed them to his wife Kim, a retired teacher, and she validated his instinct. “She said, ‘Wow, this is awesome! I wish I had had this program when I was in the classroom!’” Terry reports. Terry and Kim have raised two sons, Chris, 26, and Bradley, 24. When he is not sharing WriteSteps with school leaders or volunteering in his community near Grand Rapids, Michigan, Terry enjoys biking, running, and swimming. In 2007 he swam the Straits of Mackinaw to raise funds for youth mentoring, and next week he and Chris will compete together in an Olympic Distance Triathlon. They’re also training for an Iron Man competition (with a 2.4 mile swim, 112 mile bike ride, and 26.2 mile run). We’re rooting for you, Terry! Suzanne will speak in Spokane, WA, on June 25. Herman will be at the National Charter Schools Conference June 20-21. Charter school leaders – drop by our booth at the National Charter Schools Conference in Minneapolis on June 20-21, see the most dazzling smile on the WriteSteps team, and get all your Common Core writing questions answered at the same time! 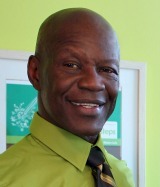 Meet none other than WriteSteps Awareness Ambassador Herman Humes, a veteran K-5 teacher and WriteSteps curriculum creator – you’ll be glad you did! “The past, the present, and the future walked into a bar.